Run to the end of the corridor, pick up a giant piece of chalk, and draw whatever you want onto the wall. This is Abacus, Bluecoat’s summer exhibition for families. Across the venue’s four galleries, newly commissioned works are designed to inspire the minds of children into watching, drawing, reading and making. The shrieks of children fill the air. Simon & Tom Bloor’s ‘New possibilities in familiar situations’ (2017) occupies the space that runs parallel to School Lane and includes giant blocks of coloured chalk strewn across the floor, with blank walls waiting for your mark. It’s a space that’s crying out to be manipulated by children, and the gallery walls display wobbly names arcing towards the ceiling, potato-shaped likenesses wearing wide smiles. Passersby group outside on the other side of the window, watching the children as they jump on the chalk blocks and skim the broken-off parts across the floor. One young boy picks up all the small pieces of chalk and arranges them in groups according to their size on the windowsill. If the aim of the work is to engage children and, as a secondary consequence, their parents, into more active roles within the gallery space, ‘New possibilities in familiar situations’ must have succeeded. An invigilator describes how seeing a child-friendly space from outside has brought plenty of people into the gallery who otherwise would never have come in, and in this sense, the artistry of the work goes beyond its physicality; it has created a new community for the Bluecoat. 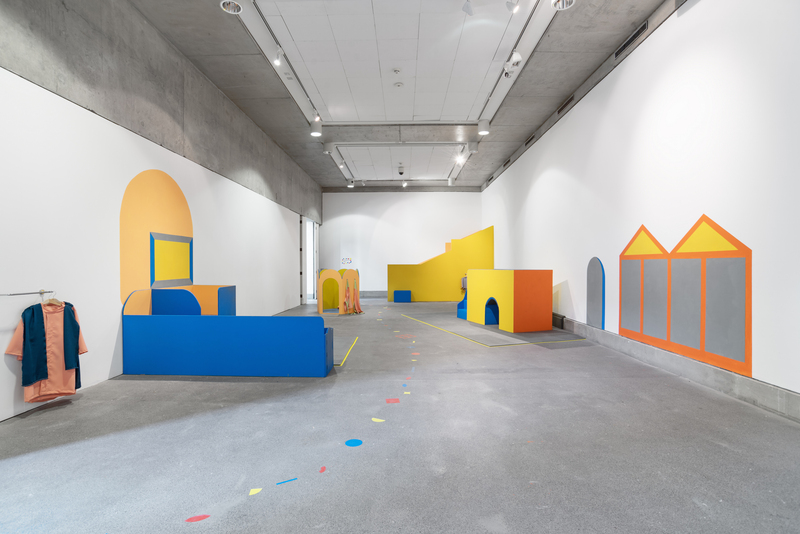 In Gallery Two, Emily Speed’s work ‘Structures for Play’ (2017) consists of architectural replicas of ‘adult’ spaces, shrunk down into child-sized proportions. The interactive space is a reminder that galleries should be welcoming to children, with the work demanding even adults engage in make-believe narratives. The structures have taken ownership, loudly and with joy, offering up an imaginary world where adults are awarded a privileged position: the ability to see inside, and be welcomed back into childhood once more. Abacus is an exhibition that might easily be misunderstood. When creating a play space with art in mind, it would have been easy to make something that is essentially an aesthetically-charged playground. But Abacus is as much about the empty space, and therefore the inevitable bits in between – not just the pre-existing structure. What do we draw when we’re given a blank piece of paper? How do we fill in the gaps? If we consider the most important thing about art as being how we, as an individual, interpret it, then Abacus must be the most artistic and thoughtful exhibition Bluecoat have shown in a while. The space is created as a prompt for the creative, and ultimately, there’s something incredibly moving about that concept. Abacus continues at the Bluecoat until Sunday 1 October. and entry is free.